What backdrop options do you offer? Although you have three standard options for your basic PartyBooth packages (white [great for decorating yourself], black, and environmental [great if you have a warehouse with raw brick or location with a cool colored wall]) we often have a handful of custom fabrics available for as little as $25, foil streamer curtains for $50-$75, and other decorating ideas we’d love to share with you! Do you have different lengths of coverage available? Our standard time is 3 hours which has proven to be the most common necessary time for different styles of events. It works out great for the time it takes to set-up, tear-down, transport, and prepare ahead of time but if you want more time we can easily add more hours in one (1) hour increments. How long as PartyBooth photo booth been in business? For over 6 years we have been operating different levels of PartyBooths in places as far away as Naples Florida and close as our own neighborhoods. In 2013 Dan Terpstra of Terpstra Photography began designing the “perfect booth” for distinguished clientele and in 2015 he began building it. The prototype for the current booth was created and tested and now we’re producing many more. The PartyBooth photo booth was created by two cooperating studios who specialize in many types of photography ranging from Weddings, Portraits, and Commercial work to Editorial and Event photography. Can I have multiple prints for every photo taken? We can set-up your event to do 2 of every single photo or more if you wish. For a standard 3 hour event it’s only $35 each additional set! How do your photos print? Do you get a “photo strip” with 4 photos on them? 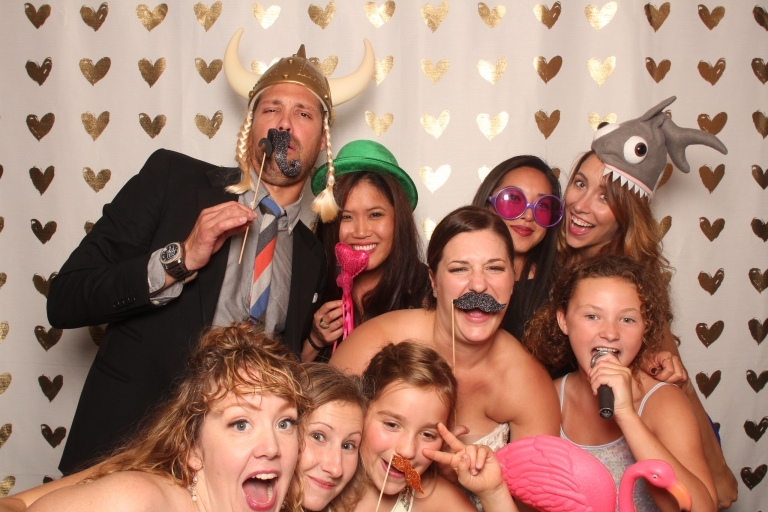 We love the old fashion photo booths like you saw in the mall as a kid and loved those little tiny photos but have really reinvented the photo booth experience with the PartyBooth right down to the prints! We provide a FULL-SIZE 4×6 PREMIUM print that features 3 total photos; 2 slightly bigger than the photo strip and one large one with a easy-to-read message along the top of each print.